Obsession about a mysterious past event turns into an unexpected horror. 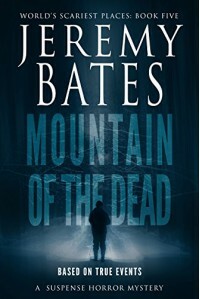 I enjoy and appreciate the writing style of Jeremy Bates, like his descriptive narrative, his casual voice, and I have read most of his novels, but this story leaps ahead of the others in the Scariest Places series due to the intense historical background that was cleverly added as a thread against the current day's story plot. The true historical event that happened in the Russian mountains back in 1959 that was named the Dyatlov Pass Incident, was well researched and smoothly intertwined that tale (which Bates totally expanded creatively) with the main story of the protagonist's search for answers. It was more than a search though, the protagonist was obsessed with the original mystery, compelled to do the trip. More important, the old mystery was intriguing by itself, then add the current story of an obsessive man trying to come to grips with demons by throwing his all into a crazy expedition, dragging his BFF along, meeting up with unlikely climbing mates, who of course all have a reason for being there as well, and it makes for a stew of explosive scenes. There were moments I felt sorry for his dearest friend who faithfully followed Whitey and hoped things hadn't turned out the way they did for him, but .... it is a horror story. I could not have predicted the action scenes with the racing for your life kind of momentum, literally the story took me by surprise. As original and unseemly the characters who banded together were, the last few scenes were even more unexpected. There were extra horrors added to the story when the main character and friends stumbled across additional mysterious and deadly places, while on their way to the final peak/pass. I enjoyed reading this story very much and highly recommend this novel.